The office gossips, whingers and moaners exist in all office environments and can be hard to avoid. Their constant complaining and negativity can sap your personal resolve and, if you are not careful, you can easily become just like them. Indeed, a recent study found that three-quarters (73 per cent) of workers claimed that a good working relationship with their colleagues was the primary reason for enjoying their work. But how do you deal with such colleagues and keep your own attitude in check? According to researchers at the University of Berlin, workers who whinge about their job or their boss and spread vicious gossip while doing as little work as possible may have fallen victim to a new condition called ‘post-traumatic embitterment disorder’. The researchers found that people who are passed over for a promotion, embarrassed in front of colleagues or those who feel their true worth is not recognised are most likely to develop the condition. The result of which affects their performance at work and at home and traps them in a vicious circle of underperformance and despair. As such, they feel down-hearted and helpless but can also be aggressive. They are also more likely to throw "sickies" to avoid going to work. So, before you instantly react to their negativity, try to identify the causes - it will help you respond in terms of how you can help the situation instead of feeling resentful at how the person is acting. 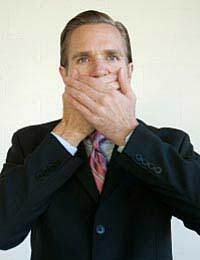 Often moaners do not realise what they are doing, so alerting them to the fact in a sensitive or diplomatic way may be enough to make them stop. However, if you choose to ignore them and do not deal with the situation, you may find yourself in a situation whereby you are moaning about the moaner. So don’t moan back. You may be enduring the wrath of a nasty boss or the continual moans of your workmate. But, if you don’t counter their aggression, all that negativity will eventually take its toll on you in the long run.Focus on the things that make you happiest instead of dwelling on the bad elements at work – the neg-heads will soon tire of coming to you for a whinge when they see that they are not affecting you. Remember, you can’t control other people’s attitudes but you can control your own. When was the last time you were able to refrain from smiling when the person you were talking to is laughing? It has probably never happened because human nature dictates that we mirror the behaviour of the people we interact with. By being transparent, work-conscious and honest in your work, a colleague who continually gossips about you or others will eventually run out of things to say if you don’t give them a reason to gossip. If you are faced with a confrontational situation simply deal with the issue at hand. Avoid dragging up past issues because this will confuse the situation to the point that you may even forget what the original qualm was all about in the first place.Attack the root of the present problem. Once it is resolved, bury the hatchet and forget about it. Ultimately, it is the responsibility of the negative person to change their own attitude and behaviour at work. Even though they may have a legitimate right to be aggrieved it is not justification to vent their disappointment or frustrations on their colleagues. As a colleague or manager, you can help that person to take ownership of the issues in a way that demonstrates concern for both their problems and the well-being of the rest of your colleagues.